Career Stability/Performances & Task Completion: Stability on the job (or) experiencing satisfaction over professional matters (or) ability to complete the professional tasks from 1st to 16th March 2019; and delays in completing the tasks from 17th to 31st March 2019. Returns on investments: Good profitability on investments during the entire month of March 2019, with mild fluctuations in the middle of the month. Business Performances/Task Completion: Ability to complete the works related to business from 1st to 16th March 2019; and delays in completing the tasks from 17th to 31st March 2019. Profits & Payment collections: Good profitability during the entire month of March 2019, with mild fluctuations in the middle of the month. Ties with Government, Tax & Banking Authorities: Ties & interactions with the Government & Tax authorities remain good during the entire month of March 2019 with mild fluctuations on the relationships during the middle of the month. Business Goods (or) Saleable Products: Moderate but fluctuating values during the entire month of March 2019. Debts/Borrowing capabilities: Low Debts (or) limited borrowings (or) limited ability to borrow money during the entire month of March 2019. Movable & Immovable Assets: Moderate but fluctuating values during the entire month of March 2019. Expenses/Losses: Moderate expenses (or) ability to manage expenses (or) ability to meet the financial commitments during the entire month of March 2019. 1st to 4th March 2019; and from 11th to 15th March 2019: Delays/deadlock on sales & marketing related activities; and on job searches & job promotions. Deadlock with employers (or) superiors. 17th to 26th March 2019: Unwanted (or) unexpected expenses (or) difficulties. Budhan/Venus combinations from 1st to 23rd March 2018: unexpected hurdles on visa/immigration related issues; and unexpected damages to assets/stocks/goods. Facing comfortable position on job searches, job promotions, sales & marketing related activities. Mars/Shani combinations from 28th to 31st March 2018: Developing highly illogical and regressive ideas/beliefs; and behaving in a more violent manner. Spending time/money/efforts on fulfilling the tsaks/assignments. Expenditure Levels: Financial deficit to manage the expenses (or) forced to spend less due to paucity of funds from 1st to 16th; and increased expenses (or) enough finances available to manage expenses from 17th to 31st March 2017. Budhan/Venus combinations from 17th to 19th March 2017: Damage to assets (or) reputation. Sun/Venus combinations from 24th to 27th March 2017: Stagnation (or) delays on asset related values; and delays on visa/immigration related issues. Job Searches (or) Business Opportunities: The Kumbha Rasi (Aquarius sign) natives would remain partially comfortable with their Job searches and may not get the desired results from 4th to 7th; and from 13th to 15th; and from 19th to 22nd; and from 26th to 28th March 2016. The Kumbha Rasi (Aquarius sign) natives would face stagnation (or) delays (or) partial improvements on their Job searches from 8th to 11th; and from 29th to 31st March 2016. 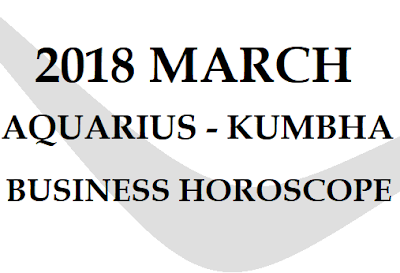 Career Stability (or) Career Performances: The The Kumbha Rasi (Aquarius sign) natives would feel comfortable and stable in the profession during the entire month; but they would be able to get significant career improvements (or) satisfactions only from 1st to 8th March 2016. 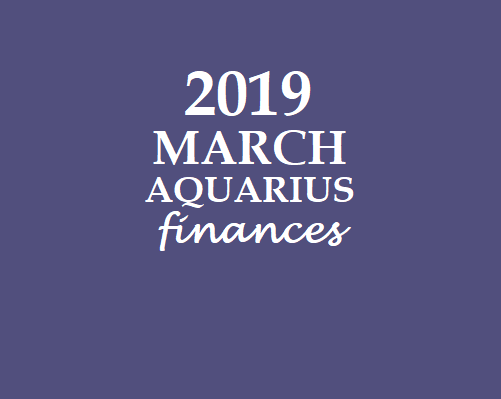 Financial Position (Liquidity): The Kumbha Rasi (Aquarius sign) natives would remain comfortable with their financial matters during the entire month; but they would be able to enjoy stronger financial strength only from 1st to 15th March 2016. Profits, Income & Payments: The Kumbha Rasi (Aquarius sign) natives would remain comfortable with their earnings (or) income related matters during the entire month; but they would be able to enjoy stronger financial strength only from 1st to 15th March 2016. Debts (or) Borrowings: The Kumbha Rasi (Aquarius sign) natives need to be cautious with their debt related issues from 3rd to 6th; and from 18th to 20th; and from 23rd to 25th; and from 30th to 31st March 2016. Expenses (or) Losses: The Kumbha Rasi (Aquarius sign) natives would face difficulty in controlling the expenditure levels during the entire month; but they would possess enough money to manage their expenditure levels during the entire month. Effects of Moon/Shani combination on 2nd March 2016: The Kumbha Rasi (Aquarius sign) natives would remain restless, depressive and pessimistic too. Effects of Moon/Venus combinations on 6th March 2016: The Kumbha Rasi (Aquarius sign) natives would face physical health issues. Effects of Sun/Kethu combinations from 9th to 14th March 2016: The Meena Rasi (Pisces sign) natives would face stagnation on ties with their life/love partner; and also with their business colleagues/partners. Effects of Budhan/Kethu combination from 16th to 18th March 2016: The Kumbha Rasi (Aquarius sign) natives would face delays (or) hurdles on their Job searches. The Kumbha Rasi (Aquarius sign) natives would face delays/hurdles on the issue of career growth (or) career opportunities. Effects of Sun/Budhan combinations from 21st to 25th March 2016: The Kumbha Rasi (Aquarius sign) natives would face delays (or) hurdles on their Job searches. The Kumbha Rasi (Aquarius sign) natives would face delays/hurdles on the issue of career growth (or) career opportunities. The Kumbha Rasi (Aquarius sign) natives would remain uncomfortable on managing ties with their love/life partner; and also with their business partners/colleagues. Effects of Venus/Kethu combinations from 25th to 31st March 2016: The Kumbha Rasi (Aquarius sign) natives would face physical health issues. The Kumbha Rasi (Aquarius sign) natives would face delays/hurdles on the issue of asset management; and also on the issues of immigrating/emigrating/ to a foreign country; and also on living/working in a foreign country.